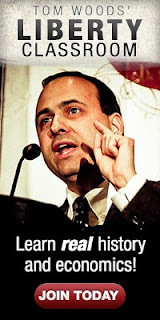 Hint to libertarian-lites, you should never try to take on Tom Woods, especially when he is in the right---which is pretty much always. 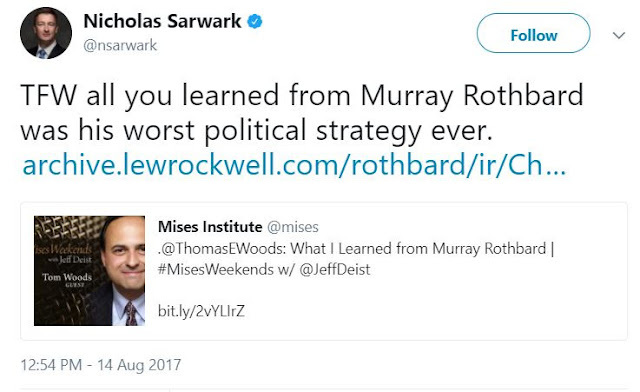 I kicked off the Mises Institute's Mises University program this year with a talk called "What I Learned From Murray Rothbard." I talked about all the history and economics I've learned from him, what his specific contributions were, and his willingness to look all over for the truth -- even to people with whom he otherwise disagreed. And why should we take advice on political strategy from -- of all people! -- the chairman of the Libertarian National Committee? Sarwark takes no position on anything that isn't at least tacitly approved by the New York Times. "Please, Mr. Good Newspaper Editor, sir, understand that I'm a good and safe libertarian who keeps safely on the 3x5 card of allowable opinion that you have so wisely laid out for us!" RW note: For the record, I did listen to Tom's speech on youtube when it first came out and there is not a word about any Rothbardian strategy. The libertarian party compromised their planks long ago. Their last decent candidate was Harry Browne and maybe Badnarik. After that it's been statist after statist with washed up republicans running at the top. Everything they do dilutes the real meaning of libertarianism. Very true, because they stopped standing on principle and desperately clung to any name recognition they could find. Darrell Castle of the Constitution Party was a far more principled libertarian candidate than Johnson, imo. However, even at principled libertarian websites like here, LRC, and others, his name was never mentioned. Maybe Castle wasn't good enough click bait? 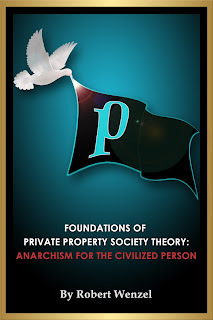 Back in the day (prior to having to confront the unpleasant fact that the two-party system, at least under the financing and regulatory system in place in the early 1980s, was not going to be displaced by a third party), I served with Murray Rothbard on the Libertarian National Committee and several platform committees. At the time, Murray's preferred strategy (for the LP as a educational and political public platform of the broader libertarian movement) can be described as "Radical in Content; Conservative in Form." He opposed "space cadets" in favor of coat and tie normal people. He viewed the central mission of the party was to educate its own members along "plumb-line" libertarian lines while putting an attractive public face on the enterprise. (All this was prior to the Koch/Rothbard split.) The point was always to take the crazies from taking over the party. This did not pan out. Thanks for sharing. Is there anywhere I could read more about this schism? Sarwark is so ineffective he couldn't get the LP to 5% in an election where millions hated both major party candidates. I heard him give a speech comparing the candidates to moldy sandwiches. He was well pleased with himself. Speaking of mold, I held my nose voting for GJ but now I see its better the LP didn't get to 5%. Woods has Sarwark and the sorry LP pegged. Sarwarks job is to drive people away. He's doing great at it.